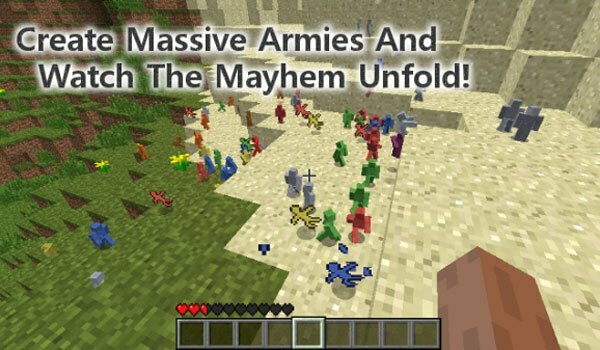 One of the first mods we have available for Minecraft 1.7.10 is the mod clay soldiers, the battles are guaranteed. Clay Soldiers 1.12.2 is a mod that will allow various types of crafting clay soldiers, that means objects can evolve in the art of fighting and giving, items, armor and weapons to be well equipped and also give them food or to heal. We may also appoint a king or crafting horses to ride on them. The soldiers make teams by colors, so if we merge different colored soldiers will attack each other. This mod requires a package called SanAndreasPs Manager Pack, to work properly, won’t work without it. How to install Clay Soldiers Mod for Minecraft 1.12.2? Paste the downloaded file “SanAndreasPs Manager Pack” .minecraft / mods folder. Paste the mod downloaded file in your .minecraft / mods folder.